Every year Charlie comes to our house and does funny things to make the boys laugh. I have to say that I love being creative and coming up with the ideas of what Charlie is going to do! He wrote on our front hallway mirror (with a dry erase marker lol) "It's beginning to look a lot like Christmas" as we had decorated for Christmas the night before. He brought out our waffle maker (which we hadn't used in a LONG time!) and brought a new box of waffle mix...but spilled some lol. He also brought fresh strawberries and whip cream and the boys loved having a special breakfast! He had a good workout on our treadmill and the boys thought this was hilarious! He put one of each pairs of socks all over the Christmas tree. The boys had to wear mis match socks to school and they LOVED having to tell their friends and class about why they had mismatch socks on! He also had a balloon sword to protect our Christmas tree (at least that's what the boy's theory was!). This week I am going to use these printables and have the boys go around the house and find them all. Love that there's jokes and interactive cards that I can use! I have created these into a downloadable file so just click on the photo below and download and print. Or right click on the photo and save it as an image. 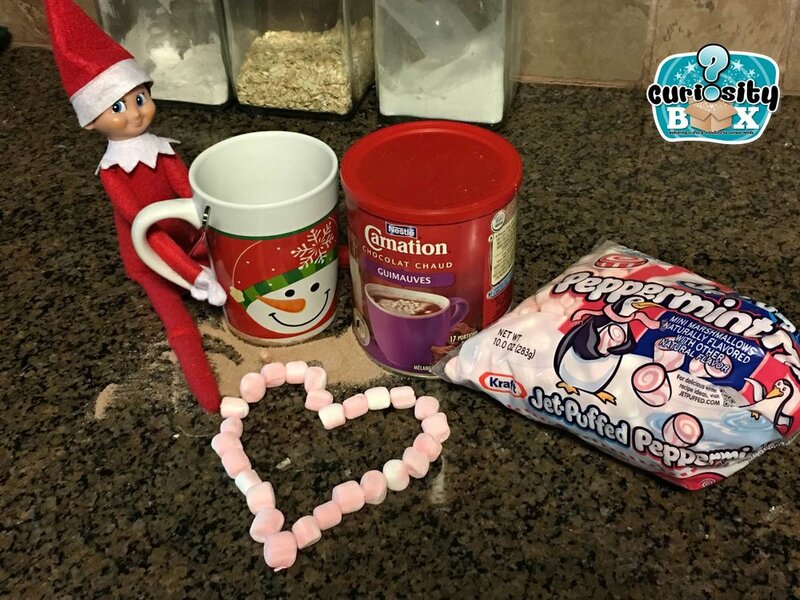 Another great way to incorporate the Elf on the Shelf is to make Elf Food! We made this last year and the boys loved it. We actually made it together and then watched our first Christmas movie! Pop the popcorn like normal. You can also use microwave popcorn. Sprinkle salt as desired. Melt butter in a saucepan (always use the stove with an adult!). Add 2 1/2 c mini marshmallows and allow to melt stirring frequently. Sir until they are melted. Add food colouring the mix. Slowly pour the mix over the popcorn. Stirring frequently. As you add more, it will become stickier, so add more mix slowly. Pour your popcorn onto a lined cookie sheet. Add marshmallows, m & m, cashews and any other desired snack food. Drizzle remaining mix over top (do not mix). Allow to dry and enjoy your elf food!! Another fun activity is to have your child fill out an "Elf Application"! 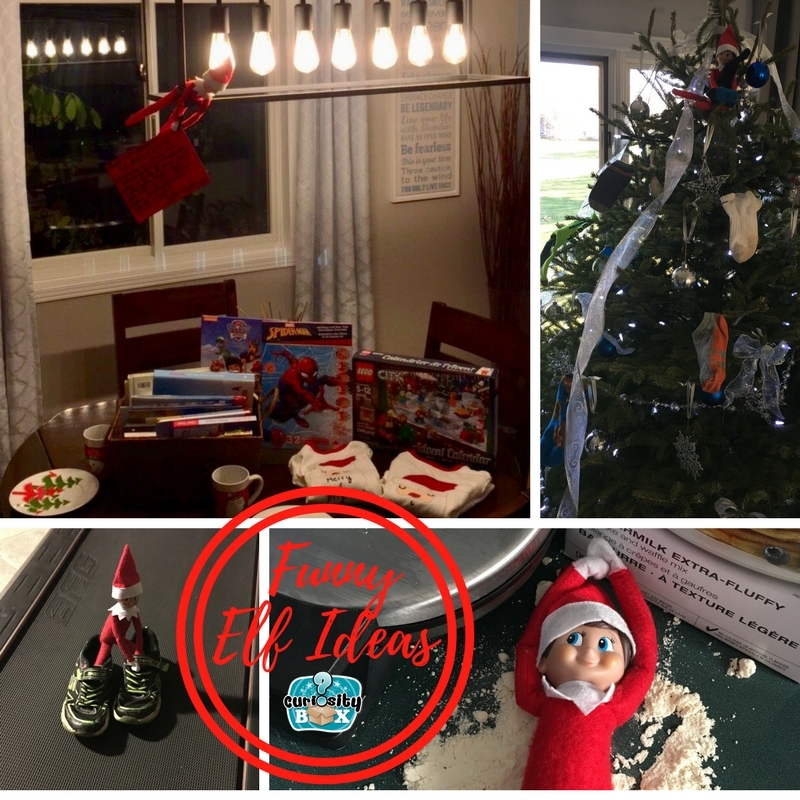 Elf on The Shelf Ideas and FREE Printable! It's that time of year again where that mischievous or friendly little elf comes back from the North Pole! 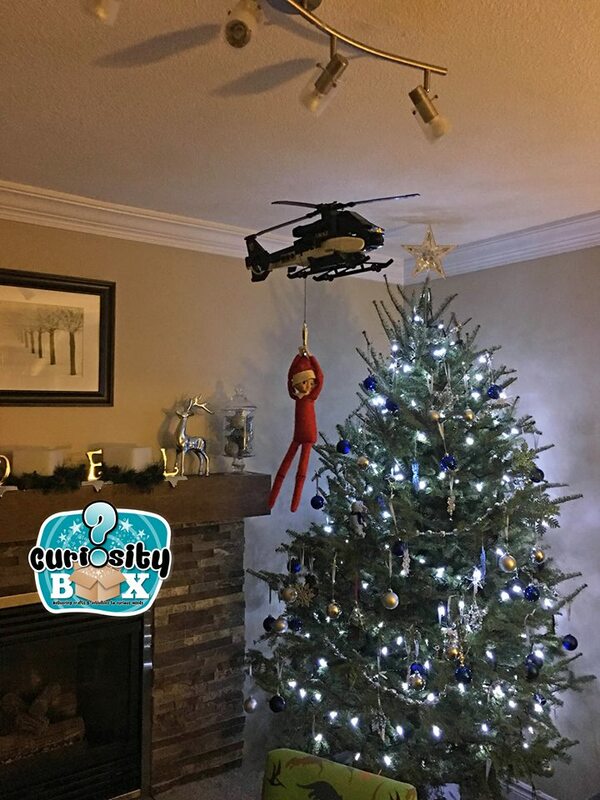 I know some parents refuse to have one as they find it way too difficult to come up with ideas, think of hiding him or her every day and just the thought of an elf watching has even creeped a few people out. 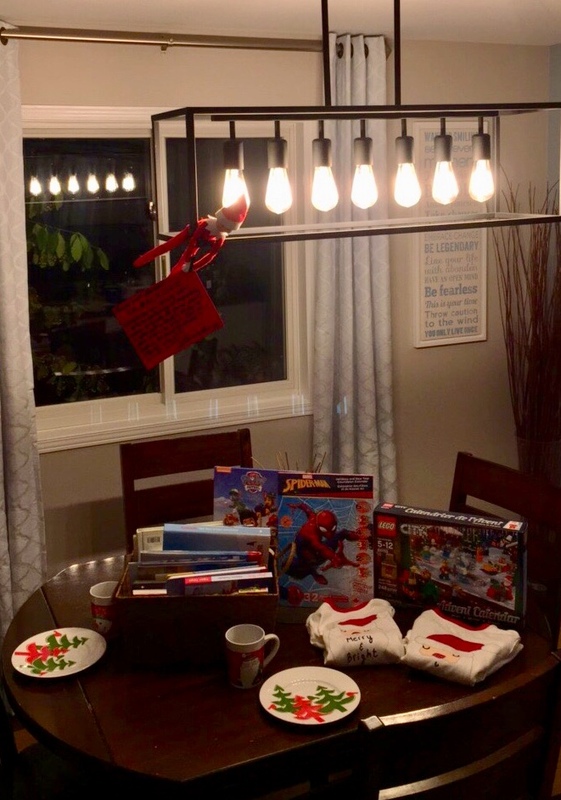 I get it...but...at our house, the elf is something that my husband and I love seeing our boys facing, hunting for him, thinking about him first thing when they wake up in the morning and just bringing more magic to Christmas! This is our boys last year when Charlie arrived. At our house, Charlie brings the Christmas books back and brings a new one each year! He sets the table for our Christmas breakfast and we get to use our special cups and plates for a nice family breakfast. At our house, Charlie comes on the first weekend in December (the boys don't know that but it works out easiest for me to remember and for use to be able to enjoy our family breakfast!). Then each day we move Charlie around and the kids run around looking for him each morning. 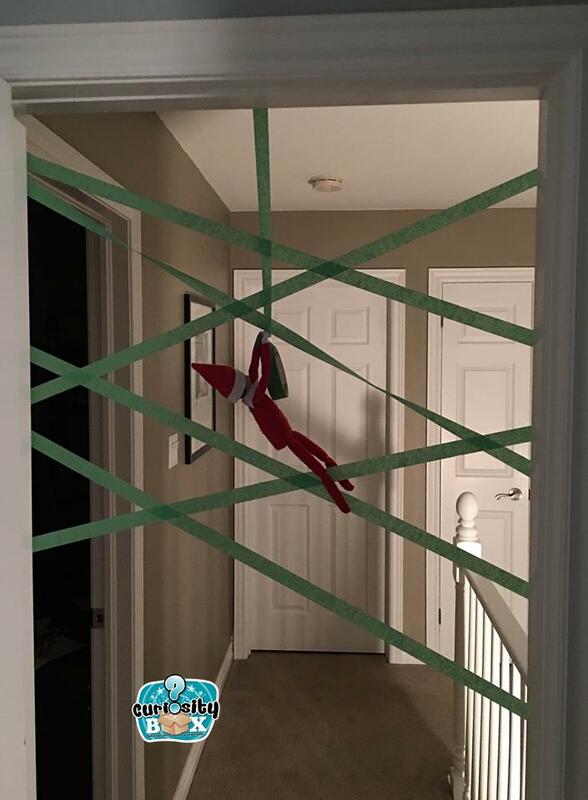 Our elf can be funny but also has sent little notes for our boys. Our boys thought it was so funny when Charlie was hanging from a clothesline in our oldest son's underwear. 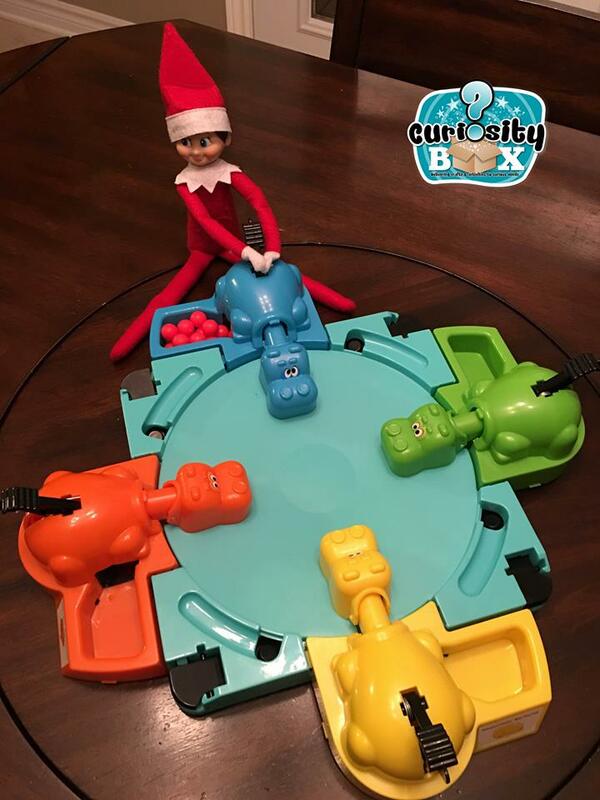 Then he was playing Hungry, Hungry Hippos. One of our favourites is when Charlie barricades a room with tape. Then all day we have to crawl under the trap to get through. It's a fun one! My husband loves hanging the boys toys from various spots in the house with fishing line so it kind of looks like it's actually flying! One of our other favourites is when Charlie takes a toilet paper roll and rolls down the stairs. The next one was fun, but I made sure to do it on a day when we weren't home and the kids weren't needing a glass of water. Charlie was up in our water dispenser with a cup, ready to get a drink! The last is when Charlie took ALL of the boys stuffed animals and lined them up on the couch. 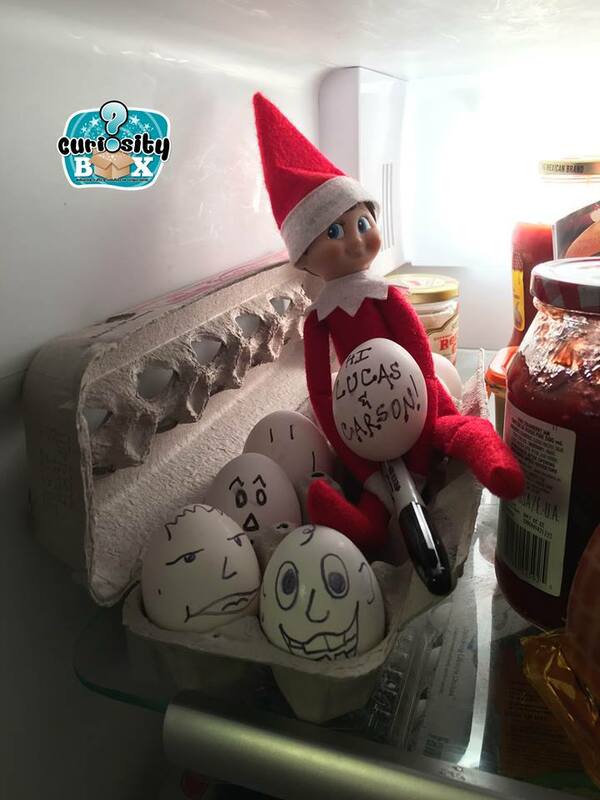 One of the funniest that the boys loved last year was finding Charlie in the fridge and he had written a message on the eggs! It took them a while to find him though and we "accidentally" found him when we went to make breakfast! Then Charlie was back to his mischievous self and we kept the toilet paper from the roll down the stairs and he trashed the stairway. The boys were in aw that he made such a mess and kept telling him he better clean that up! Then the last is a favourite. We all know in our house that Charlie LOVES hot cocoa but he always spills it! 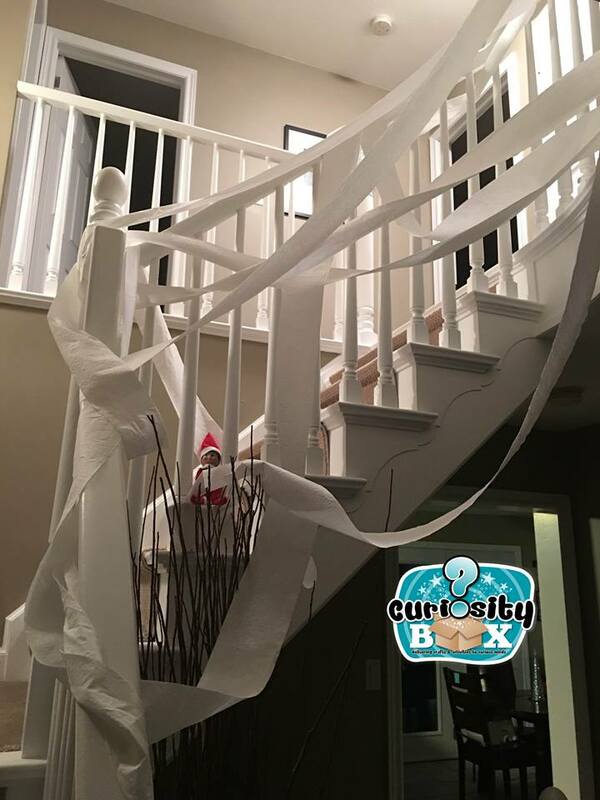 So those are some ideas on what you can do for the Elf On the Shelf this year! Here is the free printable I was mentioning. The purpose is to print it, then cut the cards out and have him using them to communicate with your little ones. I love the joke and can't wait for our boys to see this one!